International Women’s Day Celebrated in Minneapolis | Fight Back! Angella Kahn, a member of Freedom Road Socialist Organization and the Welfare Rights Committee, welcomed people to the event. Minneapolis, MN - 50 people gathered here March 7, to celebrate International Women’s Day. The event, organized by Freedom Road Socialist Organization (FRSO), included speeches, a showing of the film The Eyes of the Rainbow - a documentary about Assata Shakur - and brief toasts from trade union, anti-war, student and welfare rights organizers. Leaders of FRSO and the FMLN Committee of Minnesota spoke at the program. 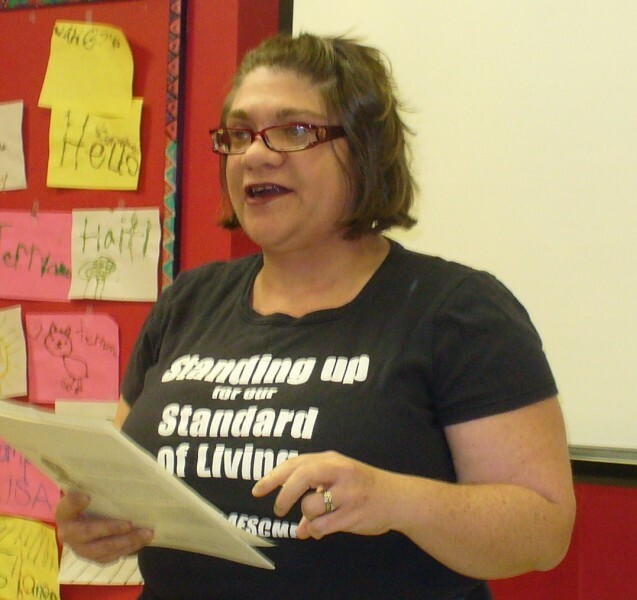 Angella Kahn, a member of Freedom Road Socialist Organization and the Welfare Rights Committee, welcomed people to the event, noting the great contributions women have made to the people’s struggle.